The Department of Environmental Management announced the award of farm viability grants to four Rhode Island-based groups working to support local agriculture. The grants, totaling $233,250, are made possible by the U.S. Department of Agriculture (USDA) Specialty Crop Block Grant Program and will support efforts to increase specialty crop production and grow the marketplace for these crops in Rhode Island. USDA defines specialty crops as fruits and vegetables, dried fruit, tree nuts, and nursery crops, including floriculture and turf grass. "Kudos to these grant recipients for their innovative efforts to strengthen markets for specialty crops and foster growth in this important economic sector," said DEM Director Janet Coit. "Our local farming industry supports the livelihoods of so many families in Rhode Island. We're delighted to support specialty crop growers and cultivate their practices through this grant round and look forward to the success of these projects." Farm Fresh Rhode Island - $40,000 Funding supports the expansion of the educational component of the farm-to-school program to increase specialty crop purchases by public school districts to include school administrators, teachers, staff and parents. Alex Caserta and the RI Public Broadcast System (PBS) - $49,919 Funding supports creation of seven new episodes of the Harvesting Rhode Island television series to promote Rhode Island specialty crop growers and educate consumers on the benefits of buying locally-produced crops. New episodes to cover topics including young farmers, the cost of farmland, renewable energy on farmland, climate change, and vertical growing. 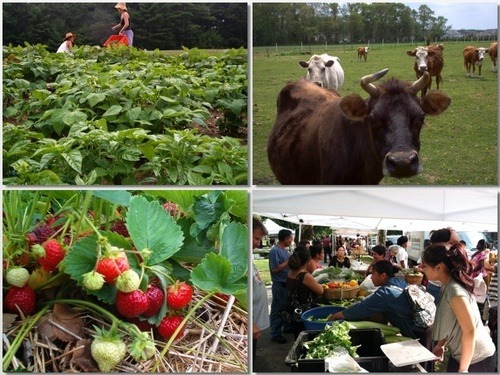 Northeast Organic Farming Association of Rhode Island (NOFA/RI) - $30,670 Funding supports NOFA/RI's efforts to train and provide technical assistance to local organic farmers. Specifically, efforts will include targeted technical training, innovation sharing and business-skill building workshops, and organic farming educational conferences for farmers. Participating farmers also have access to an advisor to support them in producing high-value organic crops. University of Rhode Island Vegetable Production Team - $50,000 Funding supports the development and testing of automated green laser scarecrows as alternatives to using propane cannons and netting to protect crops from birds. Additionally, DEM received $62,661 under USDA's Specialty Crop Block Grant Program to strengthen its buy local campaign, "Get Fresh, Buy Local." The funds will be used to help increase consumer awareness and demand for specialty crop products. Rhode Island is experiencing significant growth in its agricultural and local food sector. The state's food system now supports 60,000 jobs, and Rhode Island is one of a few states where the number of farms is on the rise, now standing at more than 1,200 farms. The state also leads the nation in the percent of its farms selling directly to the public. Green industries in Rhode Island account for more than 15,000 jobs and contribute $2.5 billion to the economy. For more information about the Specialty Crop Block Grant awards, visit USDA.gov.